Like Rick, Ben and Ligia, Jonno started his career as a snake biologist – but has been working quite a bit with toads over the last few years. 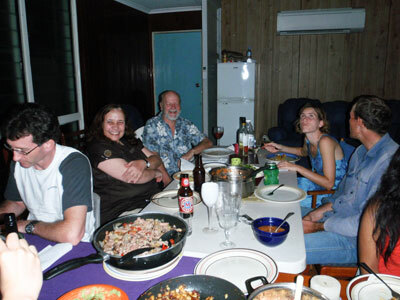 Jonno’s special interest has been the impact of cane toad invasion on our native mammals, especially the marsupials. 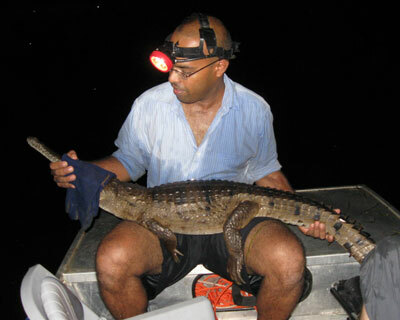 More recently, the impact of toads on freshwater crocodiles has also attracted his attention. So although he still works with snakes, Jonno now spends much of his time doing research on how toads affect these predators, and what we might be able to do to reduce that impact. Jonno has recently taken a new position at the University of Technology in Sydney, but he still collaborates actively with us on the cane toad research. A lot of our work at present stems from an idea that Jonno had a few years ago. Our research was showing that many native predators survive the toad invasion because they rapidly learn not to eat toads. Basically, they grab a toad, it makes them feel sick, and they don’t try to eat any more toads. But although many predators (including frogs, fishes, etc.) are quick learners, other species are poor at learning. These are the animals most at risk when toads invade. For example, quolls (cat-sized marsupial carnivores), large goannas (varanid lizards), bluetongues (scincid lizards) and large snakes (king browns, death adders, etc.) all are very badly affected by toad arrival. They don’t learn to avoid toads, as the smaller predators do, because the toads they grab are so big that they contain a lethal dose of poison – so the predator ends up dead rather than educated. 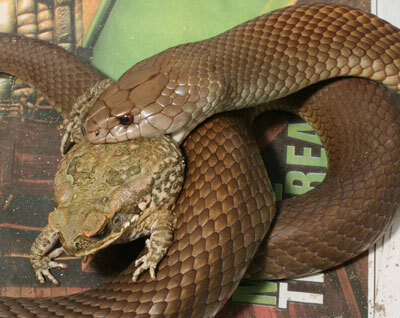 King brown snakes readily seize toads, in mistake for frogs – but the experience is often fatal (photo by Jonathan Webb). Jonno had an idea about how we could help those large predators to learn. We could take a small toad and add some nausea-inducing chemical to it, then feed the toad to a predator. The predator wouldn’t die (because the toad was small, so didn’t contain much poison) but it would be ill (because of the chemical). With luck, this experience would teach the predator to stay away from toads in future. The process (called conditioned taste aversion) is very common – you may have experienced it yourself, if you ate or drank something that made you ill, and couldn’t bear the taste of that type of food or drink for a long time afterwards. So far, our trials with conditioned taste aversion are really encouraging. Jonno’s joint studies with students suggest that it may be possible to teach toad-avoidance to most of the main groups of predators – quolls (work by Stephanie O’Donnell), crocodiles (work by Ruchira Somaweera) and lizards (work by Sam Price-Rees on bluetongue skinks, and by Jai Thomas on yellow-spotted goannas). We haven’t managed to test snakes yet, but hopefully we will be able to do so before too long. And we have already taken some of these studies out into the field, seeing if learned taste aversion to toads really does increase survival rates of predators in the real world. Excitingly, Sam found that taste aversion training increased survival rates of bluetongue skinks in the field, just as it did for quolls. The Federal Government has provided funding for this work, through the Caring for Our Country program. The Australian Research Council has also supported our work. One of the species we are trying to “educate” to avoid cane toads is the freshwater crocodile, in Ph D studies of Ruchira Somaweera (photo by Nilu Somaweera). 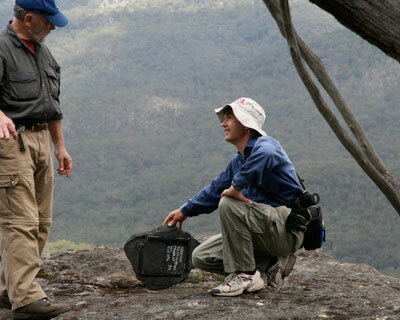 Jonno and Rick also collaborate in a major research program on endangered snakes in south-eastern Australia (photo by Terri Shine).